It was, I think, in the notices at the 11am Parish Eucharist last Sunday that I inadvertently said something along the lines of the coming week (that is: this past week, 12th to 18th September) being ‘rather overshadowed by the Food Festival’. As I said it, I was struck with how negative that may have sounded to some—what was meant, of course, was the way in which so many preparations would have to be made and so much work would be involved both in administering the Priory Centre as a festival venue and in running our own activities in the church and the surrounding grounds, so that much of the week would indeed be taken up by preparations. In a busy church community such as ours, that of necessity translates into extra work and time needed. But it did get me thinking about how we may sometimes – however inadvertently – talk about or view much of our involvement in the public events and life of this town as an add-on, focussing primarily on the added workload that this creates and the energy it requires of the many helpers to get things prepared in time. We can see our part in all this as almost a distraction from the main tasks of our life together as a worshipping community, and come even perhaps to somewhat resent the ‘intrusion’ of ‘outsiders’ and outside events, instead of viewing things more positively. This matters – and does so way beyond the specific tasks and events surrounding the Food Festival – because it is an indication as to the health of our parish church: research— such as that conducted by Robert Warren for the Church of England—has found that ‘healthy’ churches (that is: those that best embody the Gospel principles of being ‘signs of the kingdom’ and that in consequence grow both numerically and spiritually) are those that ‘operate as a community’ rather than as a ‘club’ and that ‘make room for all’ rather than being ‘exclusive’. Healthy Churches, in other words, are those that resist the ever-present temptation to view themselves only as an organisation existing for the provision of religious services to those who are ‘members’ and to see anything beyond that as a – sometimes necessary – intrusion, chore and burden, or – worse still – merely as a convenient way of generating much-needed income from ‘outsiders’. Being ‘signs of the kingdom’ is about something well beyond any of that, of course: it is about becoming visible signs of God’s unconditional love, about growing and maintaining deep and lasting roots in the communities we are called to serve, about giving expression to a whole range of gifts both in and beyond the life of the worshipping community, and about doing all this so that the values and virtues of the Gospel may permeate and indeed ultimately transform all of our society. So let me rephrase last week’s notices; the week was – and is – ‘coloured’ by and our activities ‘focussed’ on the events around the Food Festival – and the hope and prayer that what we have done and are doing may be a sign of God’s love and kingdom, and may give the people who have come as our guests and visitors nothing less than a small glimpse, an echo, of God. This Sunday sees the tenth anniversary of the terrorist attacks of 9/11, and I suspect that it has become one of those particular dates of which can be said that most of us still ‘remember where we were’ when we first heard the news (in case you wondered, I was walking to Theological College in Mirfield from the house down Stocks Bank Road, and heard about the attacks from a fellow student whom I met). The papers and radio programmes have been filled with items dedicated to the analysis and remembrance of the date, and we ourselves will do much the same in the course of the weekend. All of this is a mark of the intensity with which the events shook our world, and some of the programmes and articles have rightly pointed out that this has, among other things, revealed to many in ‘the West’ the fragility not just of our peace and personal safety, but of our society as a whole. I was struck by this some months ago, in the context of a very different television programme that looked at the effect of the Black Death on London in particular, and reflected on the extraordinary resilience that was shown at the time: although in some areas up to half the population died, there seems to have been a surprising lack of panic – obviously anxiety, fear, mourning and all the other effects of tragedy on our lives, but no sense of a mindless panic – and I remember wondering at the time how we today would have fared in similar circumstances. I still do – and I wonder also whether their resilience and courage was not, in part at least, an effect of the way in which God was a much more ‘natural’ reality in their lives and the life of their society than He is for many today, so that they somehow knew – not just hoped vaguely – that, come what may, nothing would ultimately frustrate the designs of His providence, even if they will have had as little hope of fully understanding ‘how’ that was to be so than we do today. None of this, of course, is to belittle the personal trauma, pain and suffering that the events of 9/11 caused and continue to cause. But it is to say that we and all who were and are touched by them will only be able to bear them and keep them in perspective if we, too, dare to hope and believe that even these tragic and horrific events are not outside the designs of God’s providence, however dark these are to our minds. 9/11 will then contain a call to hope, not to despair and to mindless panic (remembering all the regrettable consequences these latter things usually have for us and those on whom we turn in our rage), a call to faith and indeed to charity and reconciliation. Ladies Fellowship: The meeting scheduled for Tuesday has been postponed until October 11, when Richard Morgan will talk about his Nepal Trek. Mothers Union: Meets on Thursday from 2.30pm for an afternoon of poems and songs and a bring-and-buy. Stewarding the church—if you can help, please sign the rota at the back of St Mary’s. Cakes to sell on the stall in front of the church—please speak to Mrs Sheila Davies 853729 or bring them along on Saturday morning. Tea on the Top Lawn—if you can help service, clear or wash-up, please speak to Mrs Margaret Dodd 85856624. If you are creating a display on Food in the Bible, the church will be open all day Friday for you to install your work. Harvest lunch: The Christchurch Harvest Lunch takes place on September 25, 12.30pm for 1pm followed by a service at 2.30pm. Tickets £7 available from churchwardens. Harvest lunch: Unfortunately the Harvest Lunch at St Peter’s has been cancelled, although the Harvest Thanksgiving service will still take place on September 25. Back to Church Sunday: Takes place on September 25—invitation cards and posters are available today. Roses: There is now another opportunity to buy a rose in commemoration of a loved one or a special event for the flower bed in front of the church. Please contact Velia Ellis on 856273. Some of you may be old enough to remember a series on BBC1 called All Gas and Gaiter in which Derek Nimmo played Mervyn Noot, the bishop’s chaplain. The series ran from 1966 until 1971 and featured life around St Ogg’s Cathedral. The characters included an amiable and happy-go-lucky bachelor bishop, a very tall and very elegant and somewhat aristocratic dean (the Very Revd Lionel Pugh-Critchley) and an elderly archdeacon (played by Robertson Hare) who was rather fond of the sherry and still had an eye for the women. I can’t imagine how the script writers could dream up such unlikely characters, but the programme gave an insight into cathedral life which was very protective of its history and traditions and somewhat independent of the bishop and the rest of the diocese. A cathedral should of course, be rightly proud of its history. Worshippers at this cathedral are frequently reminded that Christians have worshipped on this site for fifteen hundred years and it was recently featured in a new book about the five hundred holiest places in Britain. This cathedral is indeed built on a hill. Parts of the building are a thousand years old and the restoration works being carried out are to ensure that the cathedral will stand in this place for many generations to come. This is indeed a holy site, hallowed by years of prayer and it is an important symbol for the city and the diocese. The gospel reading reminds us of the importance of building on a solid foundation and not on sand. There are many shifting sands in our society, and in the recent riots Britain has witnessed what happens when society lacks the values of respect, discipline and justice. There is no point blaming it on parents, teachers, politicians or the police – we all need to ask questions about the society that we have created or with which in various ways we have colluded. A society built on shifting sand will not survive, but a society built on the values of the gospel where there is love, truth, justice, mutual respect and forgiveness is a society built on the rock that will survive the test of time. A cathedral is primarily a place of teaching. It is where the bishop has his cathedra, his chair and from which, in former times, he would sit and teach. A cathedral is a place where the preaching and teaching should be biblical, inspirational and challenging. I remember some years ago attending Evensong in Cape Town Cathedral when the Dean, Edward King was preaching. [He had incidentally been ordained here in this cathedral]. As the Dean got into the pulpit, I heard a woman behind me say to her neighbour, ‘I have been listening to this man preach for nearly 30 years and I have never heard a dull sermon yet’. Wow! And I can still remember the sermon! The gospel reading challenges us, Why do you call me Lord, Lord, and never do what I tell you? Yes, there should be no distinction between what we believe and how we behave – word and action should be in perfect harmony. A cathedral set on a hill is a reminder to the city that the ‘Big Society’ is not a new idea – it is something the church has been doing for two thousand years. The Christian faith teaches that men and women are made in the image and likeness of God and are infinitely precious. It reminds us that we are given stewardship over God’s creation and entrusted with the task of making the world a place of peace and justice. The teachings of Jesus fly in the face of many modern values that are about achieving wealth, beauty and fame. We are called to bring faith and hope and love and to seek those values and virtues that are of eternal significance because they are built on rock, not sand. Jesus said, ‘Seek first the kingdom of God and his justice – and then everything else will be given to you’. Justice (or to use the old fashioned word ‘righteousness’) lies at the very heart of the Christian faith and the lack of justice made Jesus angry. The account of the Cleansing of the Temple reminds us of how Jesus reacted when he saw poor people being exploited and of how we are all subject to God’s judgement. Near the grounds of this cathedral are buried the remains of ten men from this area, who in 1839 were shot and killed in the Chartist rebellion in Newport. They were part of demonstrations and riots taking place in various towns and cities to demand justice and voting rights for the working classes. When the leaders and people of our city worship here, they are reminded that there is a higher authority and that they do not serve in their own strength alone but need the wisdom and guidance of the Holy Spirit. Jesus said that ‘to those whom much is given, much shall be required’ and so we bow in humility before the throne of God praying that we may have clarity of vision and desire only the good of others. A cathedral is also the Mother Church of the Diocese where clergy and people from all over the diocese will be welcomed. Hospitality is a sacred duty. I know one bishop who used to say that the art of hospitality is making people feel at home in your own home when you wish they were in theirs! I think he was wrong – hospitality is about opening your home and your heart in unconditional love. The New Testament reminds us of the need to welcome the pilgrim and stranger and St Benedict reminded his monks of the need to welcome others as we would welcome Christ. A Dean is not just called to be a teacher and preacher but also a welcoming host who will seek opportunities of welcoming people as visitors so that their visit is not just a tourist event but a spiritual experience in which they feel they have been welcomed, nourished and loved in the name of Christ. A cathedral is also about building living circles of community. When you throw a stone into a pond it creates ripples and circles that move outwards. A cathedral should do the same. At the very heart will be that community of love which we call the Holy Trinity where Father, Son and Holy Spirit are joined in a dynamic of perfect love. The wonderful icons of the Holy Trinity often feature the Father, Son and Holy Spirit depicted as three angels seated on the three sides of the table but the front of the table is always open to welcome those who pray before it, inviting them to join in the very life of the Holy Trinity. As the circles move outwards, there will be the community of regular worshippers, musicians and volunteers who valiantly maintain the worshipping and serving life of the cathedral. Then there will be the parish served by the cathedral, and then the city and the diocese, our link diocese in South Africa and beyond. St Benedict taught how communities are built up by regular prayer, by mutual love, by a lack of jealousy, by an ability to listen to one another and to respect those whose opinions differ from our own. But he also taught how communities are destroyed – by lack of restraint by which he meant unkind and unnecessary comments made by the tongue and by what he called ‘murmuring’ by which he did not mean justified complaint but by generally creating an atmosphere of dissatisfaction and grumbling. Benedict had very severe penalties for those sick souls who engaged in ‘murmuring’. So a cathedral must be like a bicycle wheel with spirituality at the centre but with spokes that reach out into the wider community of parish, city and diocese – and beyond. It should be a place of prayer that uses the best of traditional and contemporary music and liturgy. It should be a place of teaching and preaching. It should be a reminder to the city it serves of the values of the kingdom of God where justice and peace are paramount. It should be a Mother Church for the diocese where all feel welcomed, and not just for those great diocesan occasions presided over by the bishop, but at other times as well. A cathedral is a Christian community called to serve and build communities. This is Jeremy’s task as the Dean – ‘no pressure’ of course – and I pray that God will bless him in this challenging and exciting task and I pray that the cathedral and diocese will support him – and to God be the glory. Amen. 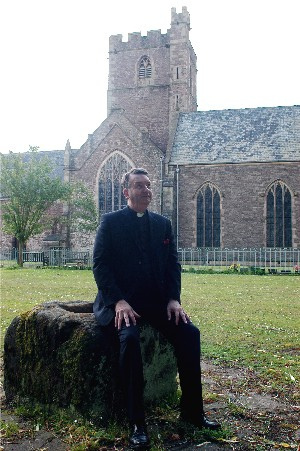 In a ‘first’ for Newport Cathedral, the installation of the new Dean, Revd Canon Jeremy Winston, will be streamed live to a congregation in St Mary’s Priory church in Abergavenny where Fr Jeremy has been vicar for the last eighteen years. Teams of volunteers are working to make the Cathedral look its best for Saturday’s ceremonial. Working around the scaffolding which is still in place for the roof restoration, furniture is being moved, brass polished, flowers arranged, leaves gathered from the paths. The celebration will focus on the role of the Cathedral as a centre of learning and hospitality in both the church and the civic communities. The Mayor of Newport will present the new Dean with a facsimile of the city charter; the Vice Chancellor of the University of Wales, Newport, will present a scroll of welcome; and the Diocese’s Learning Development Adviser will present him with a copy of the Gospels. In the Cathedral congregation will be the Mayor and Mayoress of Newport, the Mayor and Mayoress of Torfaen, the Deputy Mayor and Mayoress of Blaenau Gwent, the Chairman of Monmouthshire County Council, the High Sheriff of Gwent, the Lord Lieutenant for Gwent, and Nick Ramsay AM. Church dignitaries will include two Bishops, five Deans and four Archdeacons. Several pieces of music have been especially commissioned and will be heard in public for the first time at the service. Fr Jeremy has himself written new verses for old hymns. Modern art and technology will blend with traditional ceremony to make this a day to remember in the life of the City of Newport and its Cathedral. Fr Jeremy Winston’s last service as Vicar of Abergavenny and Rector of Llanwenarth Citra was a packed Solemn Choral Evensong, with 400 people filling the church to celebrate his 18 years in the town. Fr Jeremy, also priest-in-charge at Holy Trinity and of the Govilon group – had earlier celebrated Holy Eucharist at Christchurch, St Peter’s and St Mary’s, where he was presented with the book of messages, photographs and pictures drawn by the All Age Worship group. Further presentations took place at the reception following Evensong – a bitter sweet occasion with a great deal of laughter and not a few tears. Evensong itself had seen the choir sing a special anthem composed by musical director Tim Pratt for the occasion and Fr Jeremy preach a longer-than-usual sermon. No-one minded as he expanded on his prepared message, finishing with thanks for all who had helped him in his ministry in the town. Speaking shortly after his announcement, Fr Jeremy said “I very much look forward to belonging to a community of Christian people at Newport Cathedral, serving at the heart of the city and as the focus of the Diocese of Monmouth. I hope we shall be able to build on the efforts of our predecessors in developing the witness of the Cathedral, in caring for the wider community, and as a place of welcome for all. “I am well aware of the challenges facing both the city and diocese – challenges which will require a great deal of prayer and the rolling up of sleeves. Fr Jeremy will be installed as Dean of Monmouth and Vicar of St Woolos at Newport Cathedral on Saturday, September 10. For those who are not able to make it to the Cathedral, the Installation service will be shown ‘live’ on a giant screen in the Priory Centre with a special message to the people of Abergavenny; doors open at 2pm and the service starts at 2.30pm. Tea and coffee will be served in the Priory Centre after the service. For more details, see the Priory Centre blog. How easy it is for us to become absorbed with everyday things, going about our busy lives, often with little care or concern for what others are facing. Sometimes we find ourselves absorbed to such an extent that we don’t even give a thought to the pain or predicament with which others are confronted. In similar vein we become absorbed with a limited approach to the world, what with our horizons confined to the news presented to us. Recently we have been presented with daily news about the developing situation in Libya, whilst at the same time the plight of so many people in the Horn of Africa continues to be deplorable. In the same way we shall shortly observe the tenth anniversary of the destruction of the World Trade Centre in New York, that most awful and terrifying act of terrorism which was to lead to war and recrimination on a global scale. How ironic that with the welcome of high speed communication and marvellous advances in technology we should find ourselves faced with a world of suspicion, of resentment, and of vengeance. Not that the story is always a grim one. Sometimes we may be forgiven for being downcast and pessimistic. But there are often very many better stories and developments. The advances in medical science are staggering. Once life-threatening diseases are eliminated, terrible living conditions are reversed, and some of the most barren and parched countries have seen great advances. Even in our large and multi-ethnic communities great steps forward are being taken and a sense of belonging and inter-dependence thrives. In similar guise we might often think that the Christian Gospel is all but dying out in our communities. But there are some special exceptions to the bad news when, and only when, people abandon territorialism and seek to embrace other people sympathetically and mutually. This has to be an altogether better way than becoming entrenched, territorial and defensive. Perhaps too many towns, cities and communities have become cautious and defensive. But the challenge to such entrenchment is overcome by the gift of God’s love. For early Christians there was a similar hostile and defensive world. In fact, in very many ways it was more divided, more terrifying and a place where the embracing of the poor was looked upon with amazement. But those self same Christians found in their fellowship with Jesus Christ both strength and refreshment. It was not academic. It was merely the resolve and faith of people who looked to Jesus—the Jesus who crossed the road to embrace the poor, to feed the hungry, to rescue the lost, to heal the sick, and who brought to people in every possible situation something of the vision of a Kingdom of love and joy. It wasn’t always easy, and for his endeavour he was to die. But in his rising he was to change the world—yours, and mine. Fr Jeremy’s installation as Dean of Monmouth and Vicar of St Woolos will be shown ‘live’ on a big screen in the Priory Centre so those who cannot be at the Cathedral can share in the day. We’re aiming to supply copies of the Order of Service so the Priory Centre congregation can join with the Cathedral congregation. Tea and coffee will be available after the service. Doors open at 2pm, the service starts at 2.30pm. Parking is very limited at the Cathedral, so a bus is being organised to take parishioners to the installation service. Please contact Mrs Sheila Davies 853729 asap. A day school on People of the Black Mountains, the last novel of Raymond Williams, will be held at the Priory Centre on October 8—full details from the Tithe Barn. Raymond Williams was a distinguished intellectual, critic and son of Abergavenny. Speakers include Professor Simon Dentith (reading University), Dr Elizabeth Allen (Regent’s College, London) and writer Merryn Williams, daughter of Raymond. The Boyan Ensemble of Kiev returns to St Mary’s on its 20th anniversary tour on October 31—tickets from Clive Jones or churchwardens.